On Sunday (February 6th) my mom would have turned 52, but in September of 1998 diabetes decided she should forever be 39. When Mom first passed away, I found it hard to think of Christmas, Mothers Day, her birthday, and the day she left us (September 25, 1998) without getting teary or feeling generally miserable. I would get moody or easily upset without warning weeks beforehand. I found it hard to listen to friends and other students talk about what they’d be doing with their mothers on Mothers Day or what they got them for Christmas. I felt as though the world should know Mom was gone and therefore no one should be talking about their mothers. Well, it’s been almost twelve and a half years and I’m noticing the days now sometimes pass without thought. I still think about mom when I’m having a bad day or when something exciting happens. I think about her when I visit my sister and see my step-dad. I think about her when I’m not feeling well and wish she could be there just to offer a finger to hold – something I always did as a kid. I wonder what she would have thought about Huib and where we’d be now if she was still alive. Would we be living in Northeastern Ontario? Or would we be living closer to Aurora because that’s where her and Dad live? Would Brandi be the way she is? Would she still have that feeling of entitlement and expectation that I be there to catch her every time she fell? Or would Mom have made her grow up and make something of herself sooner than we were able to do so? All of these thoughts and questions move through my head whenever I think of Mom and what life would be like if diabetes had not decided she would forever be 39. Even though you’re no longer with us Mom – Happy 52nd Birthday!! I was on Facebook this morning and noticed an interesting topic for discussion on a service dog group of sorts I’m a part of. I guess a woman had made a statement regarding how her service dog had done amazing things for her and now it was her turn to help him. It got me thinking about Phoenix and all he’s had to go through over the past 5 years with his allergies, ongoing ear issues, age related arthritis, deafness and then his recent episode with Idiopathic Vestibular Disease. A friend once asked me how I could spend so much on keeping Phoenix, when it would be easier to just let him go. At the time I didn’t know how to respond, I guess I was in shock at the question, but here’s my answer now. Well, he’s not suffering, he’s happy and overall healthy and now it’s my turn to be there for him. Phoenix was with me when my mom passed away. He was there for me during my final year of high school. Then he attended the University of Guelph with me and never once complained about having to wake up early, stay up late and guide me through all sorts of weather. Phoenix was there for me when I couldn’t find work after completing my degree and never once complained when all I wanted to do was relax and watch some television. Then about eight months before he retired I had surgery on my right palm to remove a precancerous spot and he was there to greet me with Huib when I woke up in recovery. Phoenix has never refused to help me when I’ve asked and has always tried to be with me when I’m sad. He was there during the rough times in my life and during times of change. When he retired he took to his new job of protecting the house and greeted me at the door every time I came home. Phoenix is loyal, he’s full of life and I couldn’t even imagine turning my back on him now that he needs me. I may have to help him up and down the stairs to go outside. I may have to clean up a turd he dropped on his way to the bedroom. I may have to go out of my way to prepare his meals. And I may have to spend a little more time and money to keep him well, but it’s all worth it. Phoenix is 14, but he’s still eager to live life and help when possible. I couldn’t imagine life without Phoenix and will do anything to help, because he does the same for me. Yesterday Aries, a thirteen and a half year old female golden retriever took her last breath on earth to make her final journey across the “rainbow bridge” and join her canine friends. Aries had been losing weight over the past few months and had begun to refuse her food just after Christmas. On Friday night, just before her family rang in the new year, she began to tremble, seemed confused, and couldn’t get up or down without help. Her family worried, but couldn’t get her into the vet until Tuesday when they were told she probably had a tumor in her spleen which caused it to rupture – she was dying of internal bleeding. I met Aries in 2000 when she was working as a dog guide for Lynette (handler of Endora & now DeeDee). They were living in Oakville at the time and I took Phoenix to visit for the weekend, so we could attend Midnight Madness. The Lions Foundation had asked clients to come with their dogs and I thought it was a good opportunity to meet Lynette, whom I had been chatting with online for over a year – we met on a client chat forum the LFC used to run on their website. Aries was a beautiful 3 year old and I instantly fell in love. Now looking back I think she is part of the reason I still have my love affair with goldens. I remember the visit well because it was quite the eventful first day. I had offered to brush Aries for Lynette and was sitting on the floor combing her when Lynette’s former fiance’s dog came over and began to pee in my lap. I’m not sure what got into him, but during the commotion of getting up and trying to clean up the mess, Phoenix went over and peed on his toy creating another mess. It’s funny to look back now at that moment, but I remember being horrified and wanting to take Phoenix directly home because I was so embarrassed. Aries was fine with the whole situation and just sat there waiting for me to return to combing her. The funniest part about the whole thing though, was that Aries was the one who tended to have accidents inside and that day she didn’t have even one. Aries was never the greatest guide for Lynette, she had too many fears and stressed out easily, so after only 3 years of working she was retired and went to live with her parents in Cape Breton. I sadly never got to see Aries again, but Lynette made sure to keep me up to date on how she was doing over the years. She developed arthritis when she was about 10 and went deaf around the same time Phoenix did, but overall she was doing well in her older years – even her Inflammatory bowel Disease seemed to disappear in retirement. Even though she was never the dog guide Lynette found in Endora, Aries still remained a big part of Lynette’s life and I know she will be truly missed. Rest in peace our little golden friend, even though you may not have been cut out to be a working companion, you were still a companion and have left your mark on many who knew you. I hope you find your new home to be even more special than the one you left behind. On Thursday night we got home from a week in Waterloo to find Phoenix in terrible shape. Dad was watching him and Aspen, since they don’t enjoy the traveling and aren’t a huge fan of my friend’s current foster puppy. Huib carried him out to greet me and I was in shock to see how immobile he was. We worried all night and had him sleep with us so we could monitor his health and help him when needed. He could not sleep well on his right side, finding it hard to move and find a comfortable head position, but on his left he was a bit more settled. We set off for Guelph around 9am and called the vet from North Bay. Dad told us that on Wednesday morning around 10:30 he came out of the bedroom and stopped in the doorway. He said he all of a sudden began to tremble and fought to stay on his feet, but eventually fell over to the right and couldn’t get up. Dad didn’t have a phone or car so cared for him the best he could. He said it looked like a stroke and he was so worried. When we first arrived, Phoenix couldn’t stand and didn’t seem to be able to focus on anything. He was drooling excessively and his nose ran. His head was at a tilt to the right and his eyes twitched. I was so upset, but knew we had to take him to his vet in Guelph because I knew she would do everything possible and be honest with us regarding his prognosis. We decided to stop at his foster family’s house before the vet just in case the worst was to happen, we knew he needed to see them and they needed the visit. After visiting for 10 minutes we set off to Guelph (they live in Etobicoke). It was the longest hour I’ve ever spent in a car and couldn’t stop crying and thinking that this could be the last drive we sat together. We arrived at the office around 6:00pm and were greeted by Dr. b and one of her assistants, who just happened to attend the University of Guelph when Phoenix and I were there. Huib carried him into the examination room and placed him on the table which was covered with a blanket and towel for comfort. Dr. b asked us questions and then began examining him. After a few heart wrenching minutes she looked up and I said “it’s bad, isn’t it?”. She said it actually wasn’t as bad as we’d thought and that dogs do not really have strokes, but that they are more common in cats. She diagnosed Phoenix with Idiopathic Vestibular Disease and said that he should almost fully recover, but that I had to be willing to put in the time and effort to get him back to “normal”. I told her I’d do anything necessary and asked what was needed. She explained that there aren’t any treatments, it just takes time and patience since this condition seems to appear all of a sudden and then go away within a week or month’s time. She said there shouldn’t be any ill effects, but that he may have a permanent head tilt and his eyes may not completely stop twitching, but that he can see perfectly fine and will slowly get used to all of this. She explained that the reason he cannot walk on his own and tends to fall to the right is because IVD effects his balance and causes dizziness – I guess sort of like Vertigo in humans. Dr. B went to prepare a homeopathic remedy while her assistant and I stayed with Phoenix. He didn’t like being up on the table so Huib picked him up and put him onto the blanket on the floor where he felt more comfortable. After giving Phoenix the remedy, Dr. b assessed him further and asked that we call her on Saturday with an update and then set up a phone consult for Tuesday or Wednesday. She asked that we put him onto a mixture of mushy kibble and canned food so he won’t inhale his food and aspirate – this was her biggest worry since he could get pneumonia. After picking out some gluten-free food and paying the bill, we set off for home. It was a long day, we barely slept Thursday night and couldn’t relax in the truck on the way so slept off and on during the drive home – thankfully Dad came and drove most of the way home. On Saturday, Phoenix woke me up around 8:30am wanting to go out and eat breakfast. I put one of our doggie life jackets on him so we could use the handle to support him as he tried to walk. I found improvements in the way he held himself, standing straighter and actually weight baring, rather than needing assistance to both stand and walk. When in a down in the kitchen – while I ate breakfast – he was able to lie semi-normally and look around at all the action. At one point he even got up on his own and walked over to the water bowl for a drink before I noticed. I put him on the couch for the afternoon while I surfed the internet and watched some television. Whenever I got up and he was still asleep I attached a bear bell to the back of the life jacket so I’d know when he was awake. Dad and Huib carried Phoenix inside the last two times he went out for relief because he seemed to freeze in one spot and refuse to move any further – guessing the outdoors got a little overwhelming at night for him. The other times Dad or I took him out during the day he seemed willing to help as much as possible as long as we were patient enough to wait for him to try a step. Huib and I slept with him between us last night and once he was put onto his left side he fell asleep and didn’t stir until about 7.5 hours later. Today he seems a little stronger on his feet and actually wanted to stand while eating breakfast. Huib tried to get him to lie down, but he refused, so we just held his bowl up and watched to make sure he didn’t lose his balance. I took him out around 10 this morning and he tried to walk further than yesterday, but it is sort of a blizzard out there so I convinced him to go back inside. I have to almost carry him down the stairs, but he tries to help on the way up. He’s been sleeping on the couch beside me this afternoon, but I’ll probably take him out for relief soon and see how he does. From the research I’ve done on IVD Phoenix should continue to improve and like Dr. B said not have any real side effects other than the slight head tilt. I’m so blessed to still have Phoenix and am relieved to know that he will soon make a full recovery. After posting my entry to commemorate Phoenix’s 14th birthday, I began thinking about all the dogs I have known who have joined their friends on the rainbow bridge and decided to take a moment to recognize them. If I have forgotten anyone’s dog please send me an e-mail or leave a comment and I’ll make sure to add them. I met these two wonderful goldens for the first time when I went to pick out Aspen at her breeder’s home in Hanover, Ontario. Whitney was already retired from breeding, but Madison was pregnant with her final litter and due in just over a month’s time. They were such friendly souls and loved having us come into their home. Whitney passed away about 4 or 5 years later at the age of 12 and Madison passed on about a year or so ago at the age of 12. Both girls passed away during the day while they napped in their favourite spots on the front deck in the sun. Doris wrote me a month or so after each of them passed on and to hear her sadness made me realize how special these dogs were to her. I met this wonderful boy for the first time when he was about 12 or 13 (not completely sure). 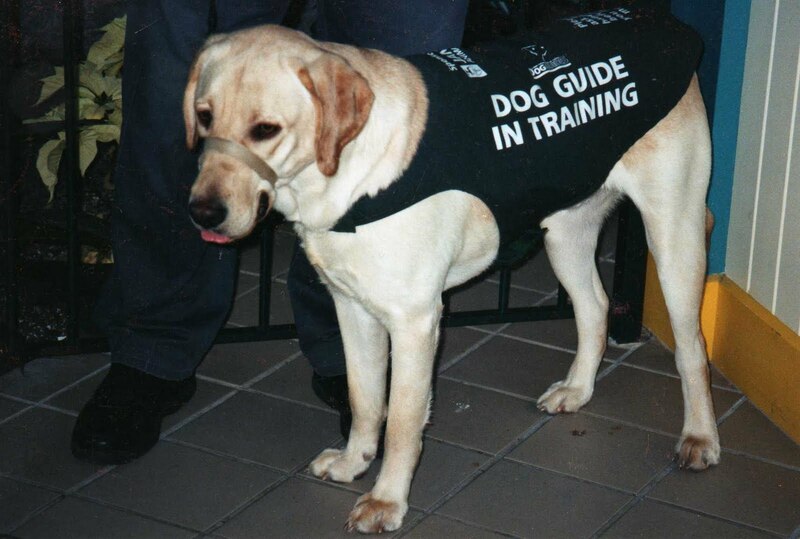 Nelson was a hearing Ear Dog who devoted his life to serving and unconditionally loving his handler. He went absolutely everywhere with his handler and when he became ill, she did everything possible to keep him well. Most dogs tend to retire after the age of 11 or 12, but nelson was a trooper and continued to work until his illness got to be too much for him. Nelson’s handler was so distraught when he passed on, but she always knew he would watch over her and began the tough process of getting a new partner. I never got a chance to meet Pockets, but through windows messenger became good friends with her handler. Pockets was a Hearing Ear dog like Nelson, but instead of being a smaller dog, she was a medium sized black Labrador retriever. Pockets became ill pretty suddenly, having developed some lumps that were found to be cancerous. She lived for about a year after her terminal diagnosis and worked the entire time. Pockets was also a loyal and devoted friend, even when she wasn’t well she insisted on helping her handler in any way possible. Pockets passed away in her handlers arms, they had gone to visit a family member and while trying to walk to the house she just laid down on the lawn and fell asleep in her handlers arms forever. Hearing this story made me cry and hope that Phoenix will leave me in a similar manner – on his own terms. I met Luther about a year after his handler first brought him home. 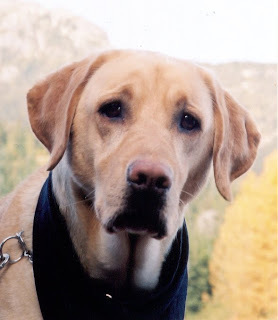 Luther was a big, goofy yellow Labrador retriever from guide Dogs for The blind. Luther and his handler were inseparable, they taught one another so much about life. He knew many skills that weren’t taught in school and gave his handler an unconditional love that would never be forgotten. I got to see Luther throughout his working years and was amazed to see the bond him and his handler possessed. Luther retired around the age of 10 and a new guide was brought in to take over his duties. Luther and his handler still maintained their bond, but sadly a year or so after his retirement Luther was diagnosed with cancer and passed away shortly after. Darwin and his handler graduated with me and Phoenix in 1998. Darwin was about a year and a half older than Phoenix, having been with a handler previous to our class who became ill and could no longer use him. Darwin and his his new handler were perfect for one another, the woman had not had a dog before so Darwin’s experience gave him the confidence most of the others in his class did not yet have. I remember being given a chance to walk with Darwin and giving him back to the trainers with a big no because he had a sway to his walk that made it hard for me to walk and I just found him to be too slow. His handler had a gait that most of the other dogs found to be difficult, but Darwin took charge and they became a team. Darwin was not the greatest dog for his handler, but at the time he was what she needed – a loyal companion who would teach her what he could and guide her safely through life. Darwin became ill around the age of 10 and was diagnosed with throat cancer. His handler tried to do everything possible to make him better, but he passed away pretty quickly after being diagnosed. It took his handler about a year and a half before she decided it was time to return to Dog guides for a new partner. She was matched with a wonderful female black Labrador retriever named Cyder, who her handler thinks was sent to keep her safe by Darwin. 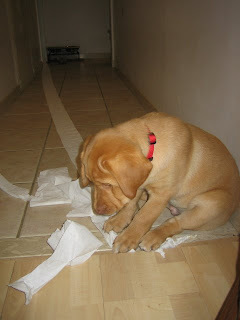 I met Nutella for the first time in May of 2006 when we went to pick up Amber and teal from their breeder’s home. Nutella was a big female chocolate Labrador retriever who had to be the centre of attention. I got to see her a bunch more times over the next couple of years as we became friends with Catherine, aiden’s breeder. I will always remember how Nutella would continually bump my hand or arm to be petted, even if I had already been petting her for half an hour and just wanted to take a bit of a break. She would always be at our sides and tried her best to keep up when we went for walks in her favourite places. Nutella was stubborn and independent-minded, but she was Catherine’s loyal companion. Nutella lived to the ripe old age of 14. She began slowing down around the age of 12, but with the help of anti-inflammatories and supplements she kept on trudging along until it got to be too much. Catherine finally made the tough decision to let her go, but before heading to the vet she made a stop at Nutella’s favourite spot. They spent a while there together before getting back into the car and heading to the vet, Nutella fell asleep forever in the back seat. A small memorial was held in the backyard that evening and she was laid to rest in one of Catherine’s many gardens. I met Annie in the summer of 2006 when we took Cessna to visit her puppy raisers. Bob and Velma do not know how old Annie truly was, but she joined their family a few years before they fostered Cessna when she wandered onto the beach at their cottage. They had put up flyers and asked neighbours about her, in case her owners were looking for her, but no one called or came so they welcomed her in. annie began slowing down around 2007, but with surgery to remove her lumps and anti-inflammatories she was able to comfortably live another couple of years. Bob and Velma had to finally make the tough decision to let her go in the summer of 2009 when Annie began having too much trouble getting up and down and when her lumps were coming back even worse. On her final trip to the vet, they gave her an extra dose of Metacam and the vet gave her the injection in the back of the truck where she fell asleep on her blankets and pillows that had been laid out for her. I met Baron for the first time in 2004 I think, when he was first beginning his service training. I met him again in 2007 or 2008 when I began volunteering with K9 Helpers. 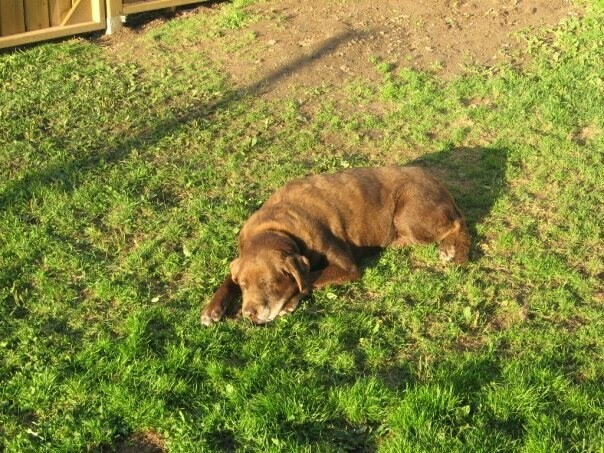 At this point Baron was just about 10 and due to health issues was beginning the retirement process. His handler was finding it hard, but she began working with her new partner in the winter of 2009. Baron came to meetings once in a while, but his handler was careful not to let him overdo it. I’m sure he would have stayed by her side day and night if he could, but his heart was not good so she needed to be careful. 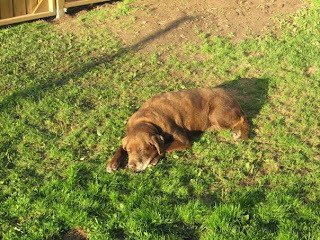 Sadly Baron’s heart gave out one evening in 2009 (I think) and he crossed the rainbow bridge to join his friends. I only had the chance to meet Bear a couple of times, one of them being in 2004 at a Dogs In the Park square dancing demonstration. I do not know much about Bear and his life, but knowing his owners I’m sure he had the life of a king. Bear was about 15 (I think) when he passed away from old age. 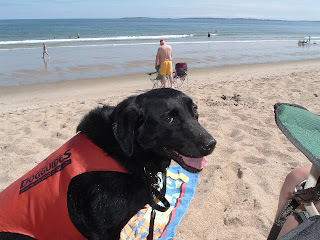 Jazz was a big male black Labrador retriever hearing Ear dog. I only got to meet Jazz a few times, but will always remember his spirited personality. Jazz got ill suddenly around the age of 7 and passed away within a week. Shortly before his death his handler learned he had a tumor that was causing a blockage in his digestive track and could not be safely removed. I met Cooper when Phoenix was about 3 years of age. Cooper was a dual Hearing Ear and Special Skills dog. I didn’t really get to see much of Cooper after our first couple of meetings, but saw him a year before his death when he attended our first Walk for Dog guides in Guelph with his handler. It was so amazing to see what she had taught him and how much he had matured over the years. She had him take his own saddle bags off and give them to her before I could give him attention and then had him put them back on before they left. He was spoiled and loved by his handler, she actually wrote a beautiful memorial for him that we read at our third Walk for Dog Guides. Cooper passed away in his sleep a few days before our second Walk for Dog Guides in 2008. As far as I can remember Cooper was diagnosed with cancer in 2007 and had gone through all the available treatments, but he just couldn’t get it to leave his body. 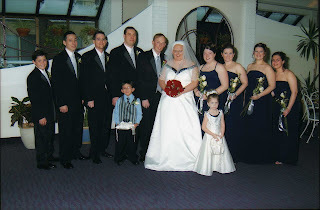 It has been 12 years since my mother passed away and 6 years since Huib proposed – such a mixed bag of emotions. 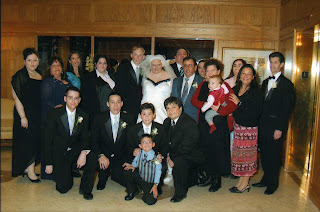 Mom was a big part of my life up until 1998 when her diabetes got the best of her and she had to leave us for a better place – one without pain and illness. 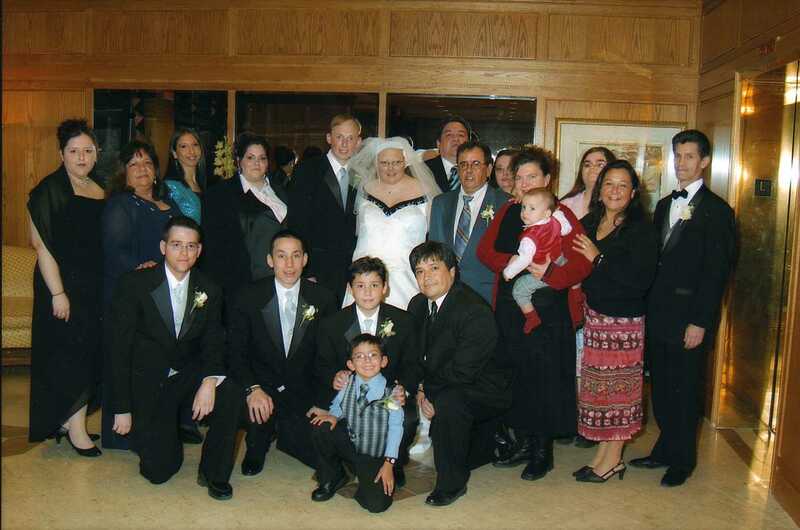 I remember our final night together, it was the Sunday before she went for her usual Monday dialysis. We used to rent movies a lot back then because mom wasn’t always up to doing much more than relaxing and spending time at home. This particular day we decided to rent City of Angels – a great Nicholas Cage movie where he’s an angel and falls in love with a living human, so decides he wants to be alive too. It was such a cool movie, to think we could someday be like the characters and watch over our friends and family. Mom and Dad left the following morning, as usual, but sadly this was the last time we’d see Mom at home. I often think of Mom every time I watch City of Angels and wonder if she is looking down on us, trying her best to keep us safe. There have been times where I know something bad should have happened, but it didn’t and I wonder if it might be her and Granny keeping us out of harms way. Huib and I have been together for almost 10 years now, but it wasn’t until 4 years into our relationship that he decided it was time to move to the next level. Our relationship has always been one of timing and moving slowly – it’s worked out so far, so why change? I remember the day he proposed, it was so unexpected. We had decided to go visit Granny and stopped at Costco on the way to pick up some stuff. He went in on his own because we had Phoenix and Aspen so didn’t feel comfortable leaving them in the car. When he came out he told me he had bought a surprise but that I couldn’t have it until Saturday (the following day). I was so annoyed, but thought it was just a yummy snack since I remembered him telling me that there were some cupcakes I liked on sale before he went in. the next day we had a good morning and afternoon, but I was eager to find out what my surprise was. He told me I had to wait until dinner, which was frustrating, but I left it alone. When dinner was over though I was full of excitement and told him I’d waited long enough so to hand over the surprise, he told me “I think you have to go pee”. I didn’t want to, but obeyed after Granny told me to behave lol! When I came out he handed me a card he had brailled along with a box… I wasn’t sure what to think of this, cupcakes don’t fit in a little box… I opened the card and tried to read the note through tears. Granny had asked me to read it out loud and I tried, but had trouble near the end – she just laughed… I guess Huib had asked her if it was okay before he proposed so she knew all along what he had planned. He told me that he wanted to propose then with Granny watching so she could enjoy our special moment – she had heart failure so we didn’t know how long she would be with us. He said he also wanted to make this day more of a happy one, rather than having it continue as a sad one – well it worked. We spent the rest of the weekend planning our big day with Granny and decided upon the date of February 4th since it was as close as we could get to Mom’s birthday (our way of including her as well). Granny passed away the following July so didn’t get a chance to see us marry, but we had no regrets because we knew she had helped us plan it all and had seen the beginning of our special day. I miss you Mom and Granny, but know you’re in a better place and that you’re never far away. We got the dreaded message last Wednesday night to let us know that our little caramel bundle of silliness would be off to begin his formal training. We were so happy to be given just over a week longer to spend with him and to really get used to the idea of him leaving. He has matured so much over the past couple of months and we have really begun to see glimpses of what he can be. This knowledge has helped us to feel a little more at ease in saying good-bye. He gets so excited when we take his puppy coat down from the leash rack and has such love for people and for helping me out – even though he has never been taught or expected to do so. Even though I would love to keep him, seeing his love for the job and his passion for helping, I know that it would be selfish to make him mine and stay home as a regular dog. He is destined to become a service dog and has always showed us this side of him. Other dogs will play for hours, but Aiden will just sit back and observe or go and play, but make sure to check in every so often. I wish Aiden the best of luck in his training and will be so proud to see him in his working jacket standing beside his new family and partner in crime. I will keep everyone posted on how he does, but for now I will close this post by sharing a poem that has been circulated for years amongst puppy raisers. So when you remember me. . .
Know I was born to set someone free!